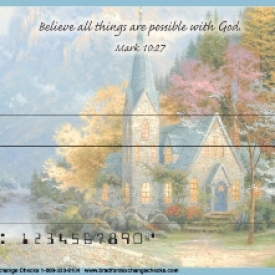 Thomas Kinkade's Signature Artwork Enlightens the Exteriors of Our Nation's Monuments on These Breathtaking Checks - Our Nation's monuments have never looked so good! 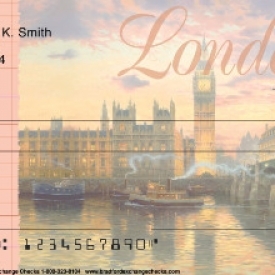 The signature artwork of acclaimed artist and celebrated Painter of Light(TM) Thomas Kinkade is beautifully presented on four address label designs from Bradford Exchange Checks(R). The United States Capitol building in Washington DC is shown in two scenes, one featuring its famous faÃ§ade surrounded by American flags and excited onlookers, and the other is a springtime sight complete with cherry blossoms. The Statue of Liberty stands tall and proud on historical Ellis Island set against a pretty pastel sky, and last but not least is an evening view of the White House all lit up and framed by a snow-frosted landscape. The elegantly scripted sayings, Stars & Stripes Forever, Proud to be an American, United We Stand, and Land of the Free are placed on the designs respectively. Plus, you'll find these America mail labels are amazingly practical too, arriving in a set of conveniently self-sticking labels. These patriotic Americana address labels are perfect for hundreds of uses, so don't wait! Order now! 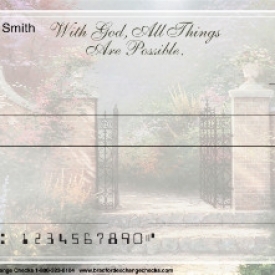 Thomas Kinkade's American Pride checks are also available. Pricing shown is for 2 boxes of Singles.